Magnus Carlsen defeated tournament leader Veselin Topalov today, and taking the lead at the Gashimov Memorial in Shamkir. Ding Liren moved to plus-one after beating a suffering David Navara. Round seven was crunch time for Magnus Carlsen, who had the white pieces against Veselin Topalov. Half a point ahead of his rival, Topalov obviously was happy with a draw but he also knew that he had lost the last six games to this opponent—rapid and blitz games in Leuven and Paris in 2016 and 2017. However, the last two decisive, classical games between these players were in fact won by Topalov; both in 2015, at Norway Chess and the Sinquefield Cup. The last one was after he could throw in a remarkably early ...g7-g5 pawn push in a Bb5 Sicilian. 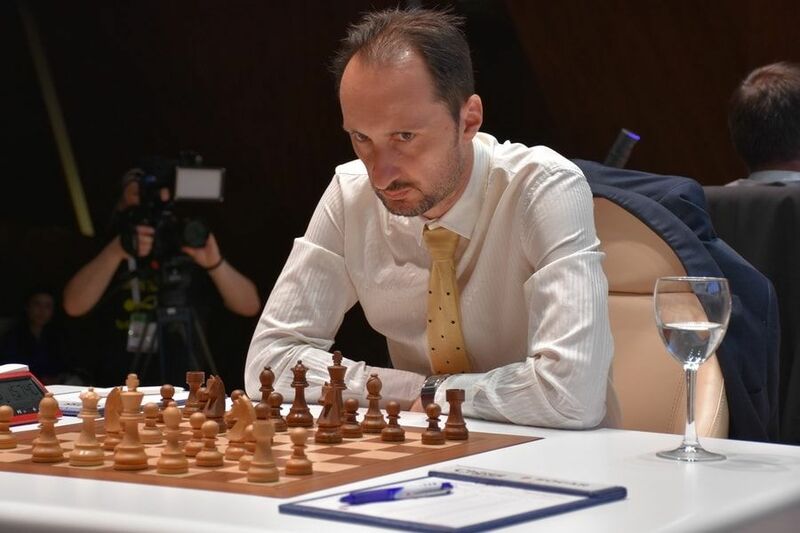 Topalov, dressed up for a big game (although he often wears a tie). | Photo: Shamkir Chess. Today Carlsen played a kind of reversed Bb5 Sicilian where he compromised his pawn structure but got the bishop pair in return. He admitted that he didn't have much. On move 25 things became concrete, and Topalov decided to give up his queen for rook and bishop where, as Carlsen pointed out, he could have avoided that with 27....Kf8. “I was not ready to play it somehow,” said Topalov. The commentator Ljubomir Ljubojevic's first instinct was that White was completely winning with the queen, but according to the players Black was actually really close to a draw, especially if he would have gone 38...Rf1.